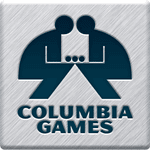 Columbia Games is one of the hobby’s veteran game companies, founded by Tom Dalgliesh in 1972. Today his son Grant works with Tom. Columbia Games has produced some of the highest rated wargames in the industry such as Hammer of the Scots and Julius Caesar. They are the pioneers of the block wargame genre, a system which has found even more popularity with newer wargamers over the past few years. Columbia Games produces the legendary Fantasy Role Playing setting, HarnWorld, first published in 1983. HarnWorld is a fantasy setting which is still in strong circulation as more players find their way away from the high fantasy mainstream settings into a more realistic, gritty world. New material is regularly being written and is available quarterly and at a great discount through the very affordable HarnQuest subscriptions. Recently, Columbia Games has moved headlong into family games, which Tom Dalgliesh also published years ago under the name Gamma Two Games. The game The Last Spike has firmly stamped Columbia’s heavy footprint in the family game arena with a thunderous dust cloud by reigning in one of the most prestigious awards in board gaming, the MENSA select award, (from MENSA, the high-IQ society).